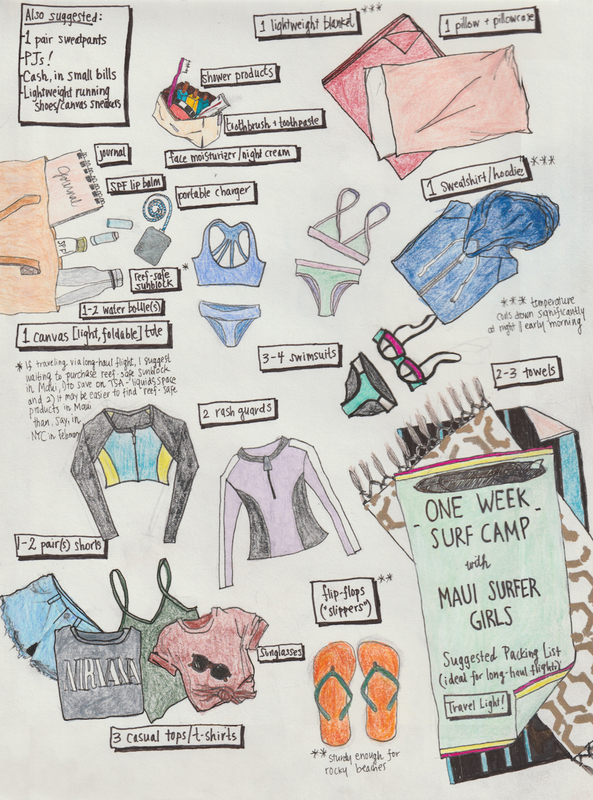 Mahalo to past camper Laura Yamasaki for sharing this awesome illustrated packing guide with us! One of the most common questions that we receive after a booking for women’s surf camp is “What should we bring?” We’ve updated our packing list for our expanded women’s camps, so please review our guides below! Mahalo to past camper Laura Yamasaki for this awesome illustration! ** we have lots of surfboards for beginner and intermediates, but if you want to bring your own, that’s fine too! ***There are laundry facilities available. Our coin operated machine is 1.00/load! Plus we’ll have our logo store with shirts, rash guards, water bottles, hats and more! Please pack lightly, less is more at surf camp!